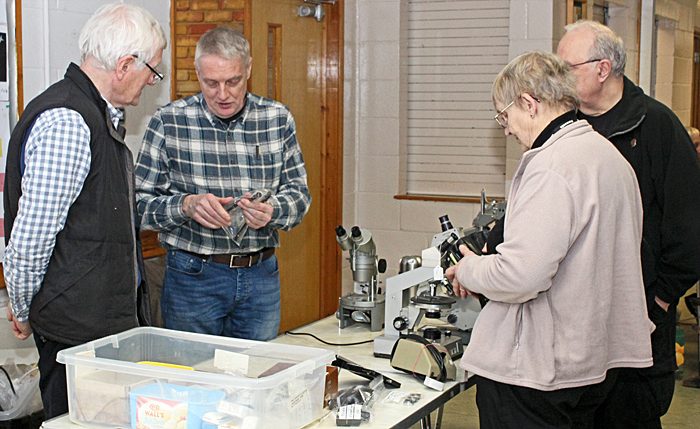 The annual convention of the Reading Microscopical Society was again organised by Mike Woof and Kit Brownlee and held in the familiar venue of St Peter’s Church Hall in Earley, just outside Reading. The meeting had been promoted on Facebook, and it was good to see some new faces, as well as lots of Quekett members, among the visitors. There was more chatter on Facebook after the meeting, from happy buyers. The morning was devoted to sales and exhibits, followed by a break for lunch and then 2 lectures in the afternoon. 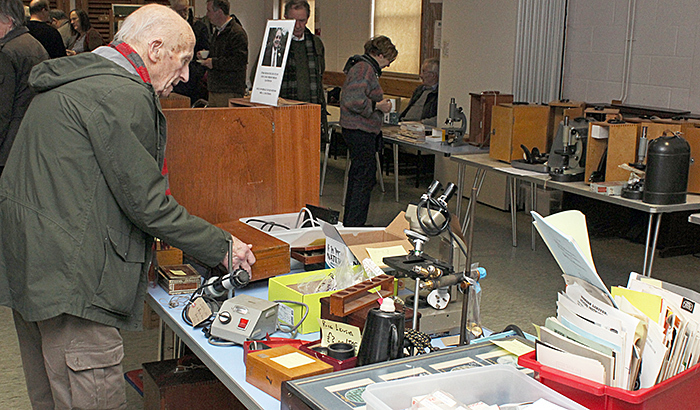 The Hall was opened at 9:00 a.m. with the first hour for setting up. 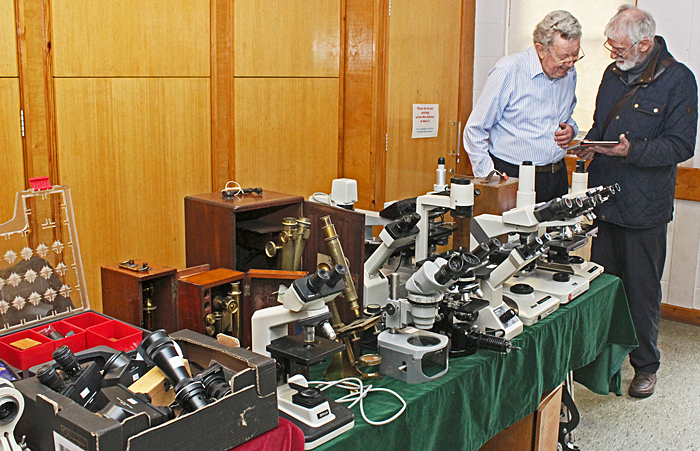 As usual, there was a good range of microscopes, objectives, eyepieces, accessories and slides for sale, but not many books this time. 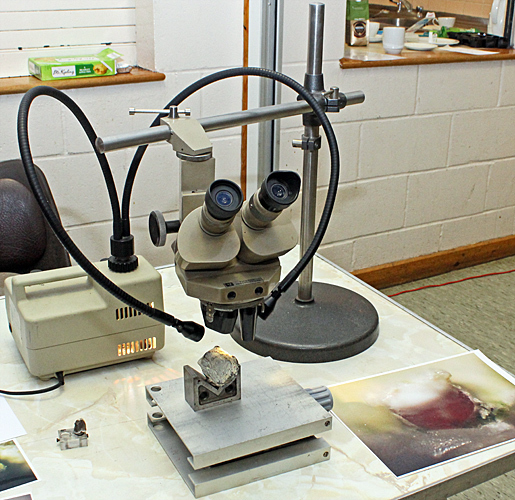 Chris Millward used his Vickers stereomicroscope on a boom stand and a Schott KL1500 fiber optic illuminator to show some small pieces of flint collected from a beach with features that he had not been able to identify. 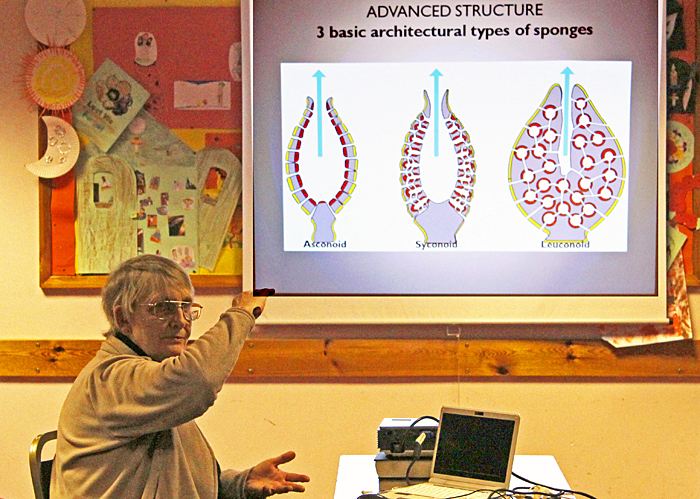 Kit Brownlee showed some items relevant to her lecture, a sea sponge from the Mediterranean, some fossil sponges and a Klaus Kemp slide of 50 sponge spicules. 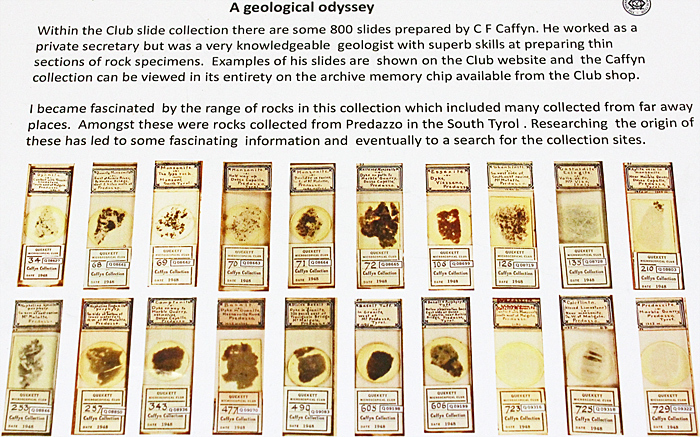 Pam Hamer is interested in the Quekett’s collection of geological slides by C. F. Caffyn, and has been to Italy to look for his collection sites in Predazzo in the South Tyrol. 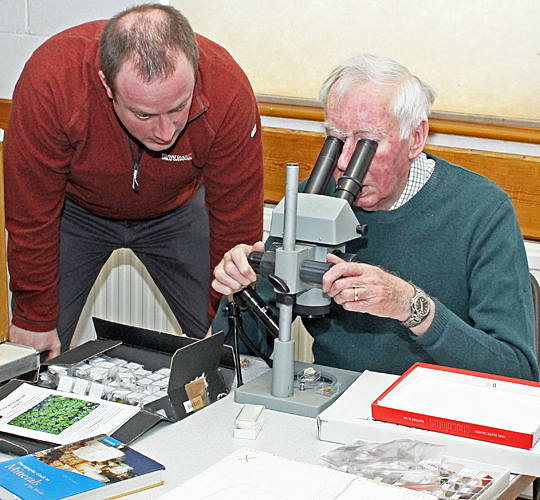 Peter Bainbridge brought lots of micromounts from his collection and some books on minerals. 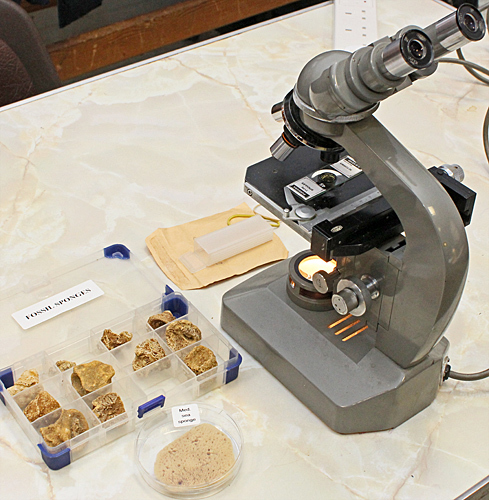 Peter brought his Russian МБС-10 stereomicroscope so that we could admire his specimens. Stephen Parker showed a Polish PZO microscope with DIC (differential interference contrast) that uses only one prism. 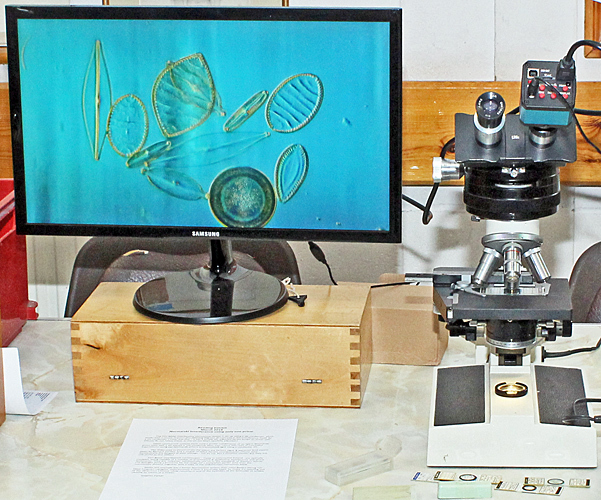 It gave impressive results with diatoms, shown via an eyepiece camera feeding a monitor. Tony Pattinson can always be relied on to put on a good show, and this year he brought a jar full of brine shrimps that he had raised from eggs. 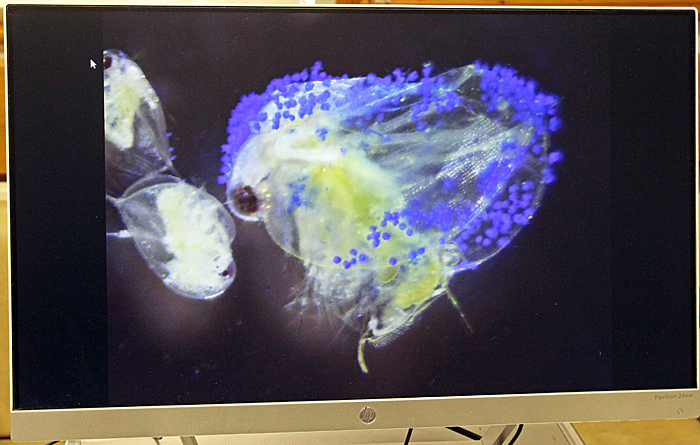 Tony brought his Polish PZO stereomicroscope so that we could watch the shrimps swimming around in a Petri dish. Tony also brought his trinocular Olympus CH-2 fitted with a 5 MP ToupCam camera feeding images to a laptop computer and a larger monitor. 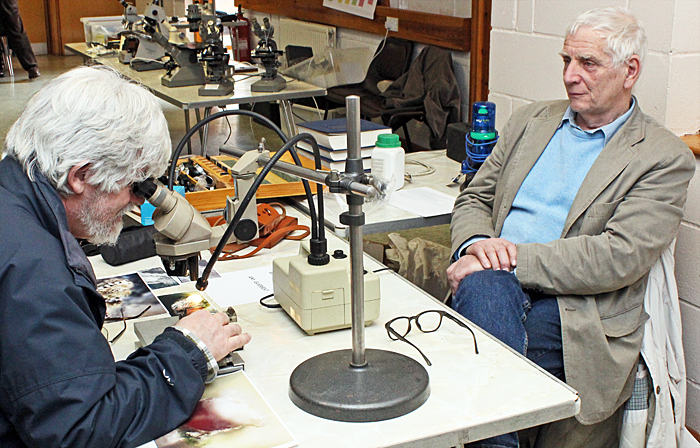 With this arrangement, Tony showed us some of his slides of waterfleas and freshwater shrimps, and he also showed us the composite images of named diatoms that he has prepared as identification aids. Tony was also selling copies of his books. 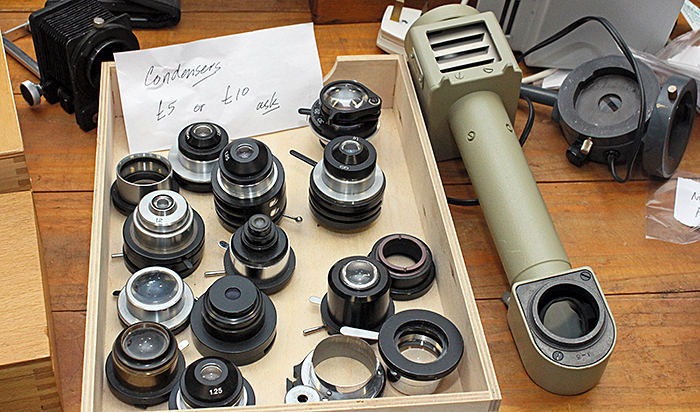 As usual, there were lots of interesting items for sale, including trinocular compound microscopes from Leitz, Nikon and Olympus, and several fibre optic illuminators with assorted straight and ring attachments. 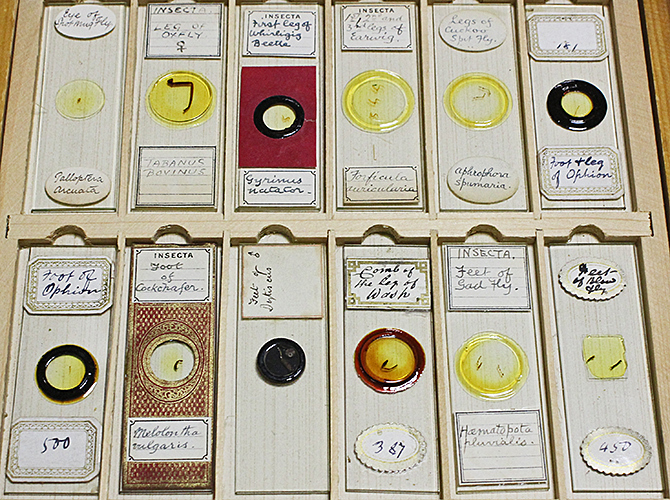 Chris Millward had a comprehensive incident light kit in its fitted wooden box, an Intel Play digital microscope and a 3-volume set of Bergey’s Manual of Systematic Bacteriology. 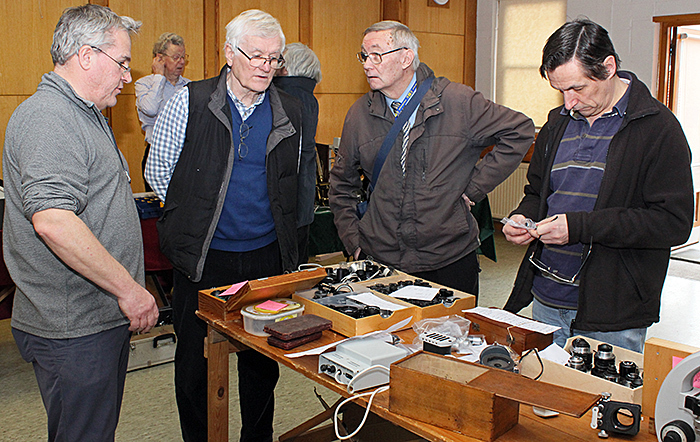 Geoff Mould was selling a fiche reader (also works with microscope slides), a UV illuminator, a centrifuge, power supplies, a variac, pH indicators and hole punches. 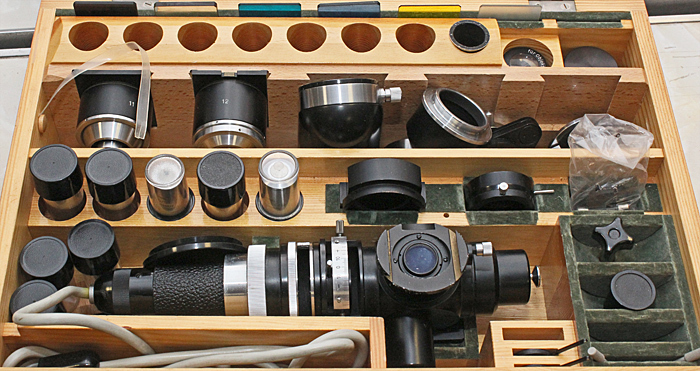 This was Gordon Brown’s first visit to Reading, and he was selling a black and brass Leitz monocular with wooden case, a black and chrome binocular with wooden case, and an illuminated 2× magnifier (Super Stereoramic) from Vision Engineering. 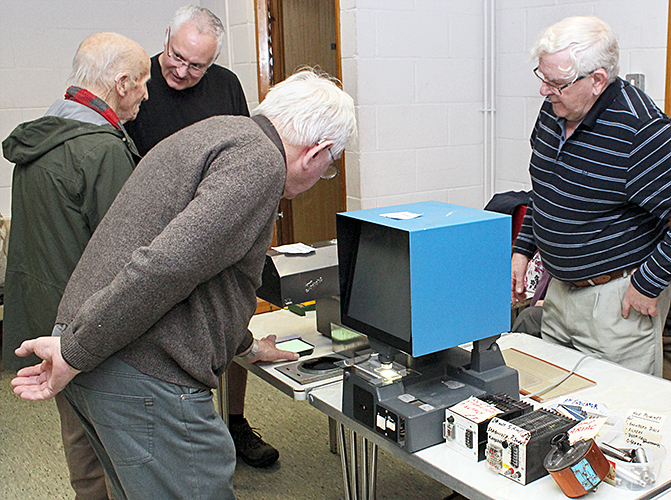 Gordon was pleased to find some Beck brochures relevant to his photomicrographic optical bench. 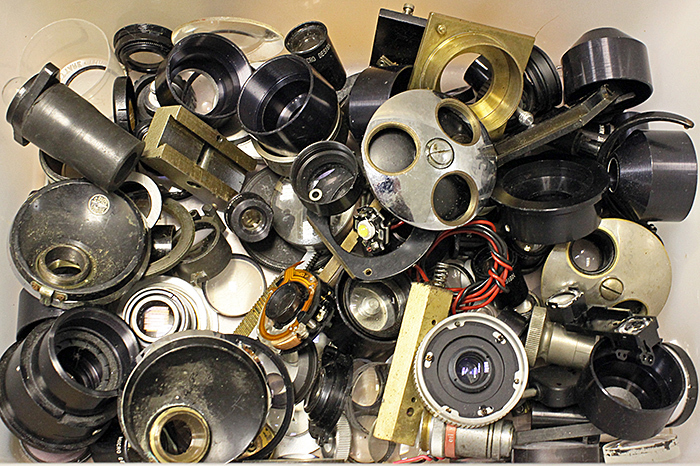 John Millham found retirement boring and is buying and selling microscopes and accessories again. 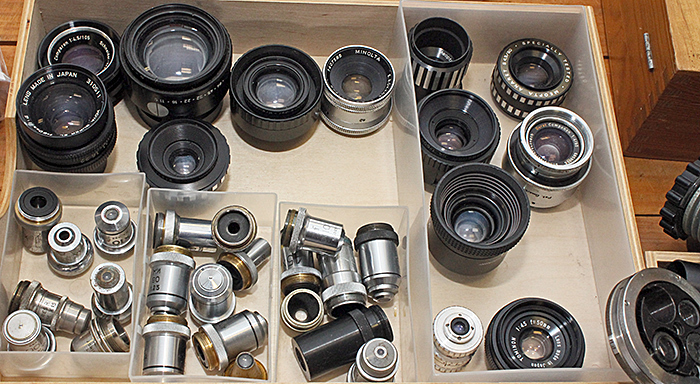 Today, he had trinocular compound microscopes from Leitz, Nikon and Olympus, and some other compound, inverted and stereo microscopes, plus lots of accessories. 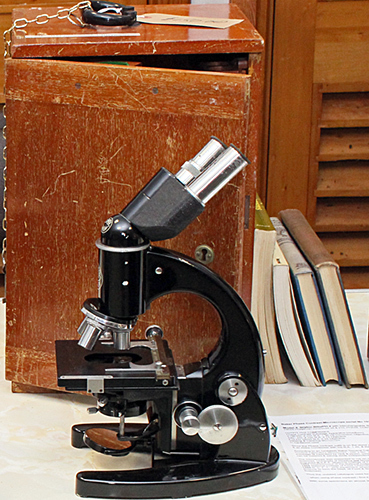 Kit Brownlee was selling a few books and a Baker Model 4 microscope fully equipped for phase contrast and normal bright-field, complete with wooden case. 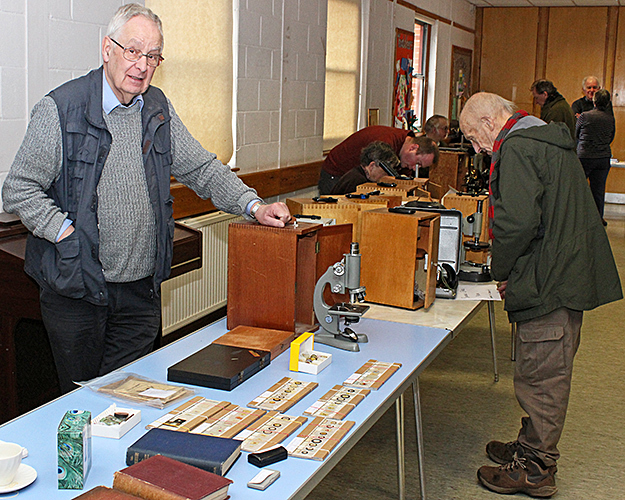 Mark Shephard was selling some slide sets, a few books and a grey Beck monocular with its wooden case. 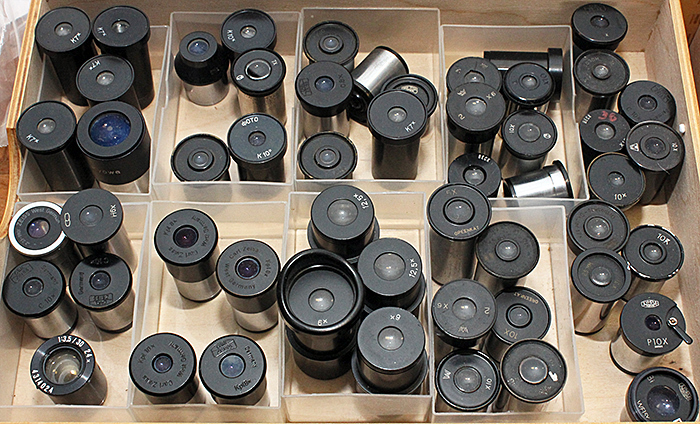 Mike Samworth and Steve Gill were selling items from the estate of Steve Edgar on behalf of Steve’s widow, including microscopes, objectives, eyepieces, condensers, an assortment of enlarging lenses and boxes of Biosil slides. 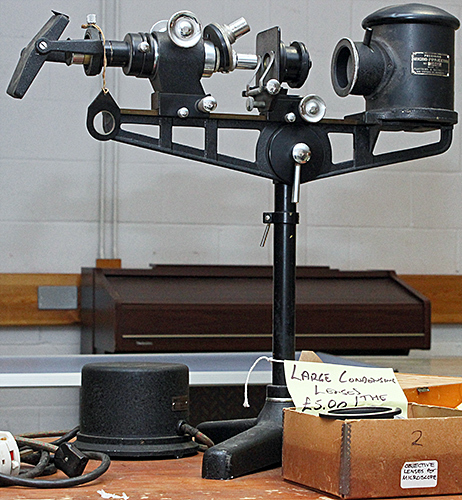 The enlarging lenses included several 6-element ones such as Componons and Rodagons at just £10 each. 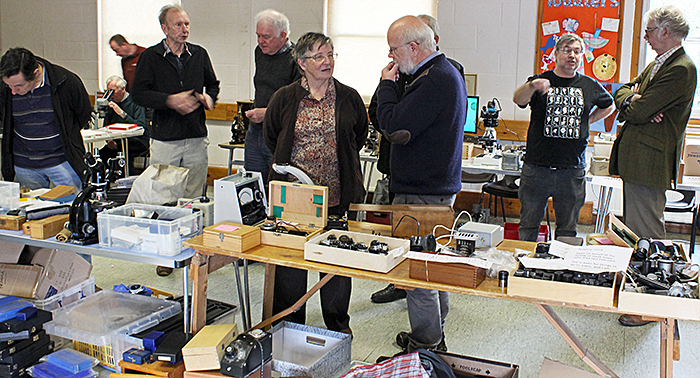 Paul Wheatley was selling some bulbs and lenses and several microscopes, including stereo, polarising, inverted, compound and stereo microscopes. 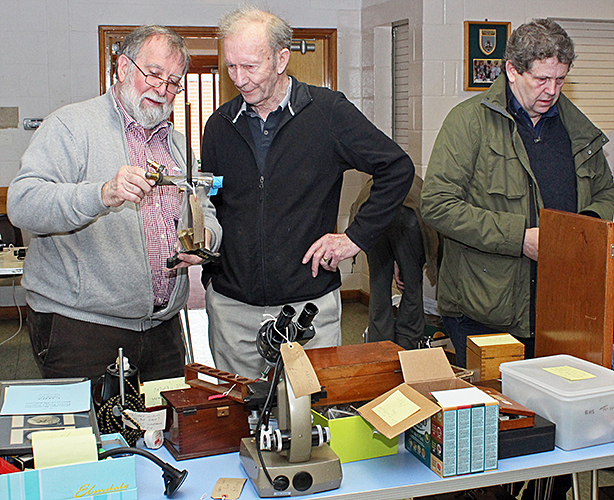 Phil Greaves brought several items from the estate of Brian Davidson that he was selling on behalf of Brian’s widow, including slides, microscopes (notably a black trinocular Leitz Dialux and a Leitz aquarium microscope), lamps and brochures for lots of microscopes. 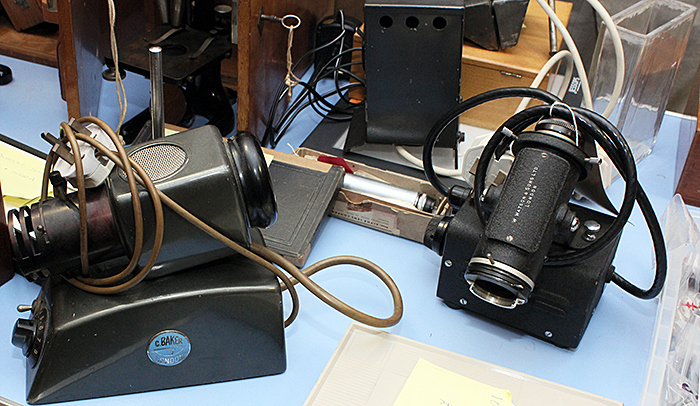 Unusual items included a colorimeter and a light box. Phil was also trying to dispose of a variety of items from other sources. Joan Bingley brought the Quekett Shop and sold some books and ties. Joan also brought some items to give away, including back issues of the Bulletin and the Journal and DVDs of the back file of the Journal (volumes 1–36 and 37–40). 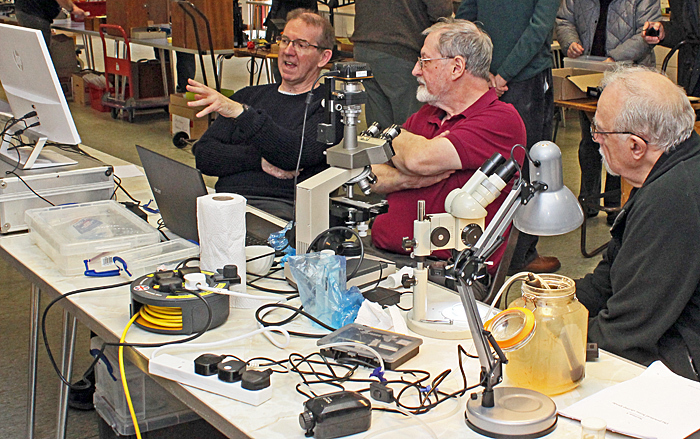 Stephen Parker was offering a Vickers M74 polarising microscope, a Reichert Neozet, a Myacope monocular, a student microscope with transmitted and epi lighting, a condenser for a Vickers Patholux and some objectives. 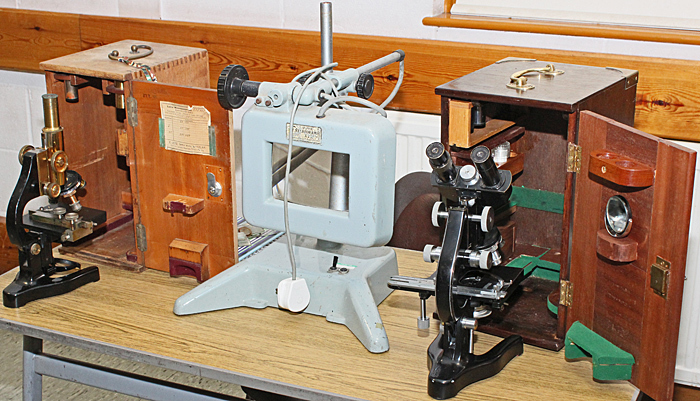 There was also a table of small microscopes from a Reading member who was having a clear out, including the little Czech Meopta AZ-3 in a grey box and several Lomos with their metal or wooden cases. 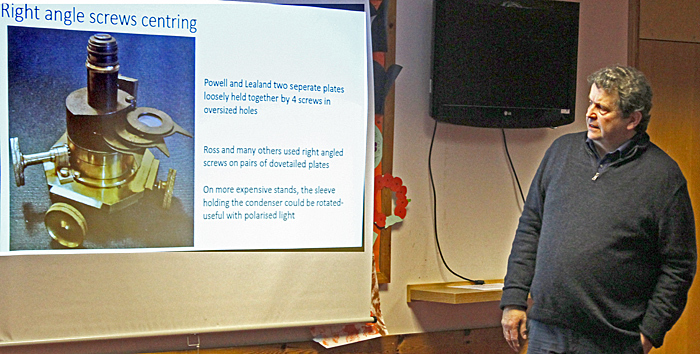 After a break for lunch, we moved to the large meeting room upstairs and Mike Woof introduced the speakers. Robert Ratford recorded the lectures on a video camera, and the videos will be made available in the Members’ area of the Quekett website. Phil Taylor’s subject was “The Victorian substage”. 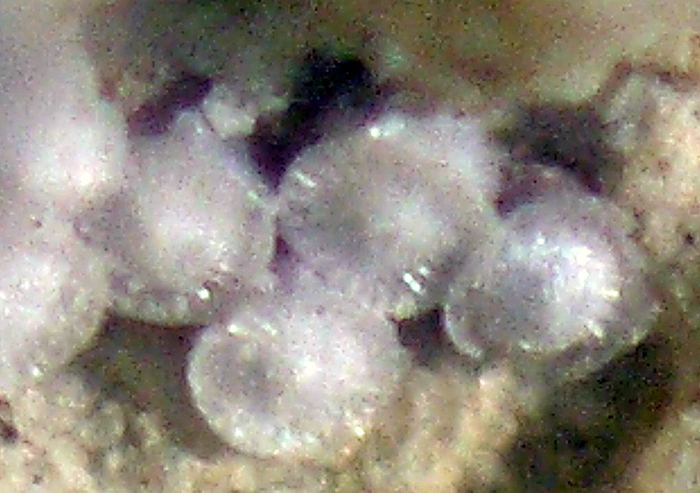 Kit Brownlee’s subject was “Take a closer look at sponges”. 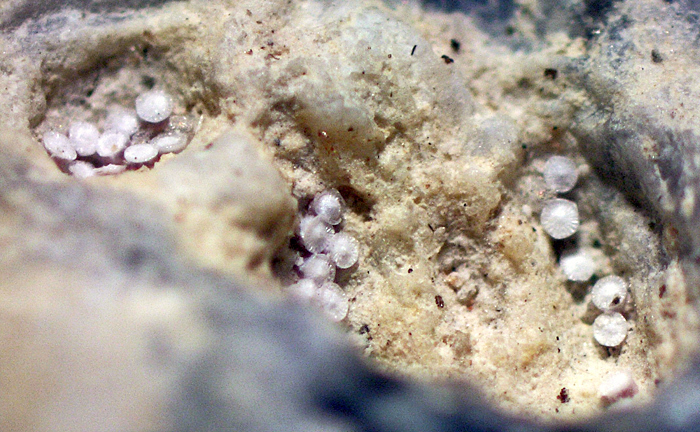 Her exhibit downstairs included a real sponge, some fossil sponges, and a Klaus Kemp slide of 50 spicules. 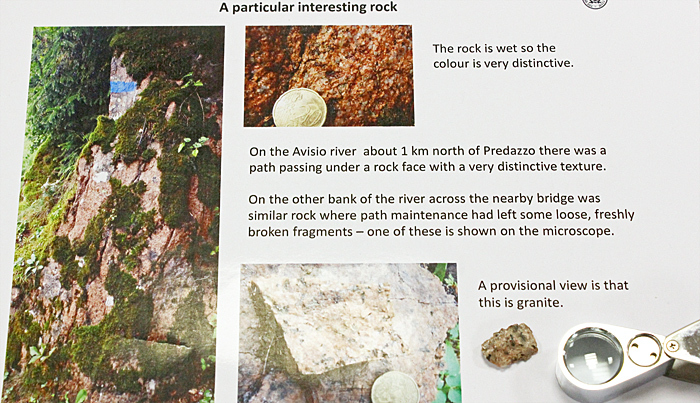 Freshwater sponges were spotted in the River Thames under Reading Bridge in 2011, and Kit gave as an introduction to the structure, biology, evolution and classification of sponges. There are about 10,000 species of sponge, but only around 150 are known from fresh water, and only 13 from fresh water in the UK. Siliceous spicules are birefringent, so they make good specimens for polarised light. Kit showed us photographs of the Reading sponges taken by V. Didziulus, and photographs of other freshwater sponges taken by Willem Kolvoort. 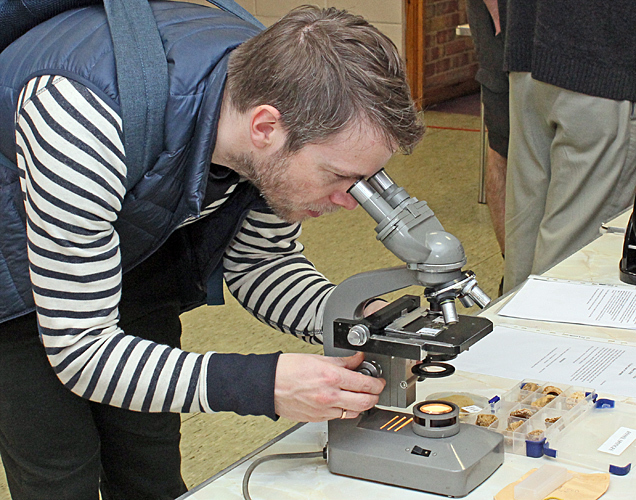 Our thanks to Kit Brownlee and Mike Woof for organising another enjoyable day for microscopists, and to everyone who put on exhibits for us or brought along items for us to buy at bargain prices.